I spent just about all of today rewiring this jazz-style guitar. It was made by Skiffle Cat who may well now be defunct? 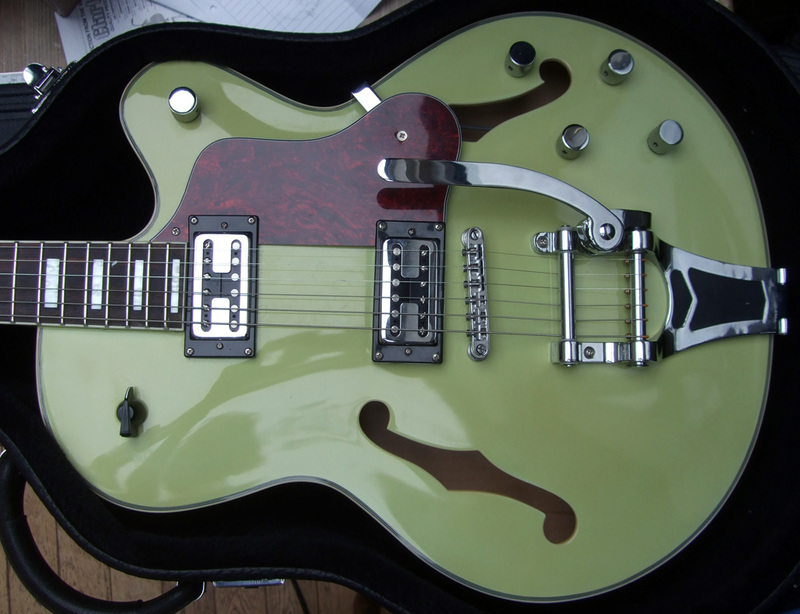 It’s not the greatest guitar in the world but it is very servicable and now sounds the business. Last time it was here I dressed the frets, gave it a new Tusq nut and set it up but today was the turn of the electrics to be improved. 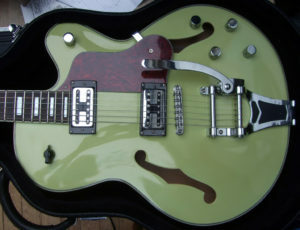 The owner bought a set of The Creamery’s “Swing-O” pickups to be fitted and some ideas about a wiring scheme. We decided on individual volume controls for each pickup, plus master volume control, together with treble and bass controls and a 3-way rotary switch with chicken head knob for pickup selection. Getting the circuit right took some time, both to design and install. I based the tone stack design on G&L’s PTB system, explained here at Planet-Z but changed the component values so that it worked well with the Creamery pickups. Everything was wired with single core screened cables so the result should be resistant to external interference. The controls have proved to be extremely versatile and the bass control in particular is great for thinning out the sound of a jazz box.